Little Bitterns had been resident at the Charca de Suarez all Winter and on this occasion the male bird gave great views in good light. It makes a great shot in the reeds with that fierce yellow eye burning brightly. A furtive but handsome bird to start the year with. 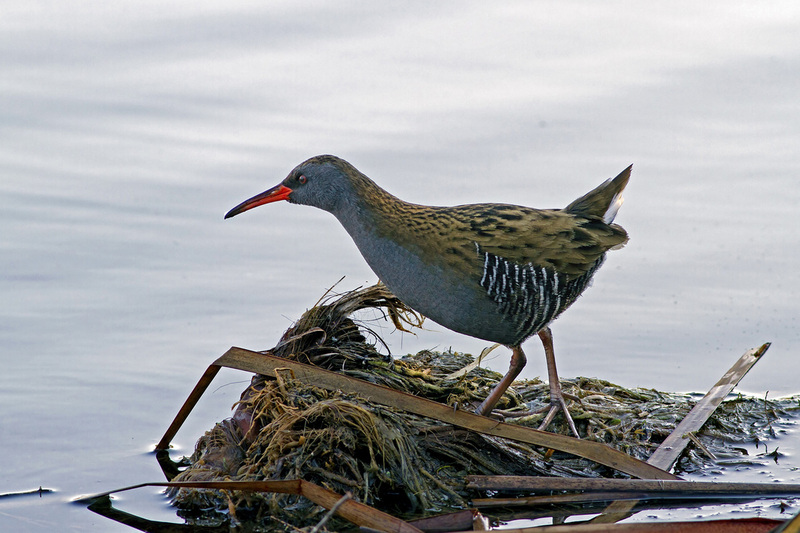 Another furtive and elusive bird the Water Rail, again shot at the Charca de Suarez makes an excellent subject for February's gallery entry. I have been chasing this bird for a long time so was very pleased to finally capture it out in the open at last. A trip to Donana via Brazo del Este in March proved to be a bit dull. The landscape was dry after a long period with very little rain, and there was no evidence of an influx of migratory birds as yet. 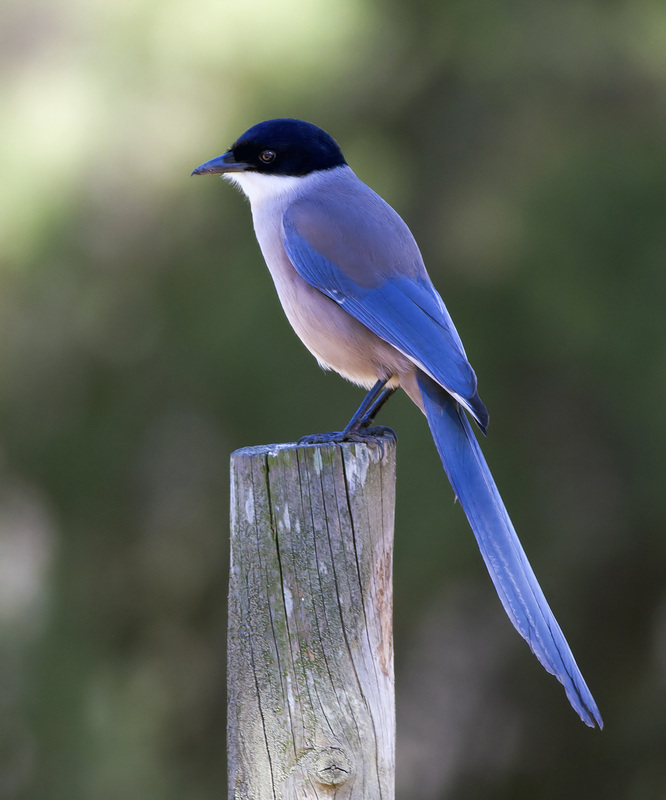 The ponds at El Acebuche near El Rocio were completely dry so in the absence of any associated bird life I contented myself with a few shots of the Azure Winged Magpies that frequent the garden and picnic area. They are so easy that one tends to forget what stunning looking birds they actually are. In fact I really like the colours in this portrait, powder blue goes well with hints of mauve and a glossy blue-black cap. So it's not a bad gallery shot for March. In April I was in Thailand visiting my daughter Louise & grandson Arlo who is 14 months old. I naturally took the opportunity to do some birding and this is one of the better photographs taken at a waterhole called Soong Lin, near Kaeng Krachan National Park in Petchaburri. 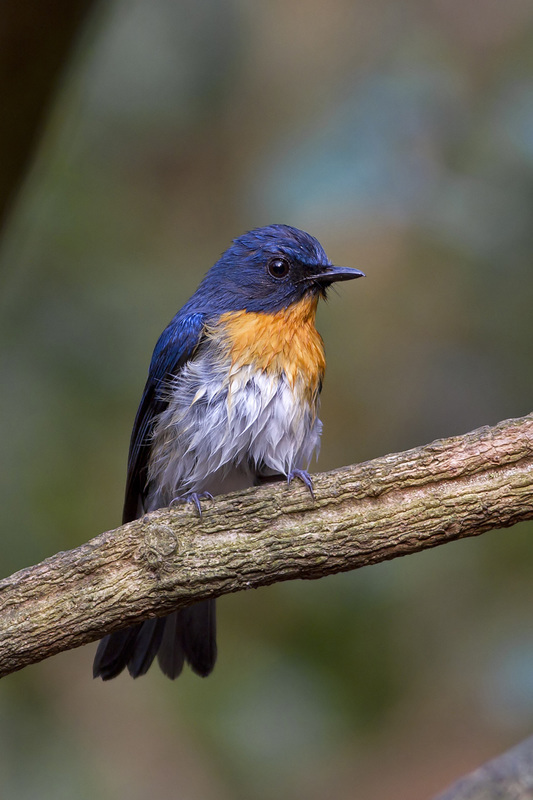 The bird is a male Tickells Blue Flycatcher which has just had a bath in the waterhole so is sporting a trendy "wet look". The lighting was excellent and the exposure perfect so the colour and detail is very good and qualify it as a gallery entry. The next entry is (Below) is another blue bird. 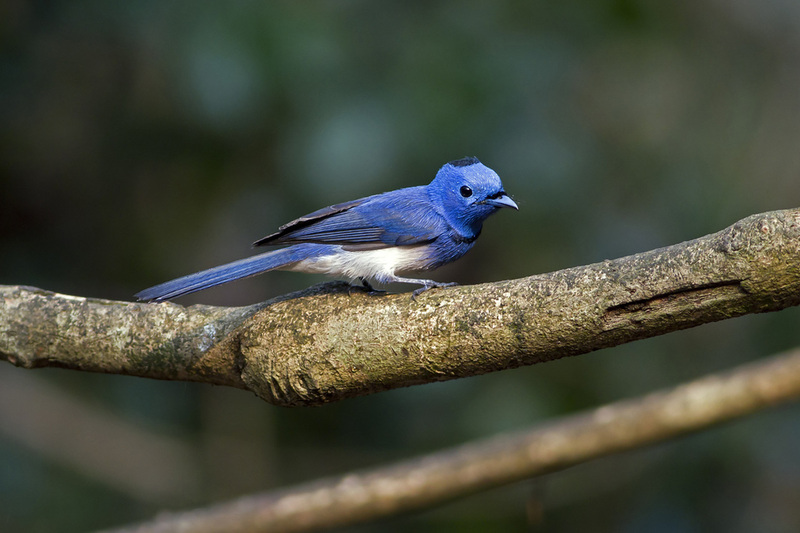 It is a male Black Naped Monarch, so named for the black crown on a deep blue and white body. 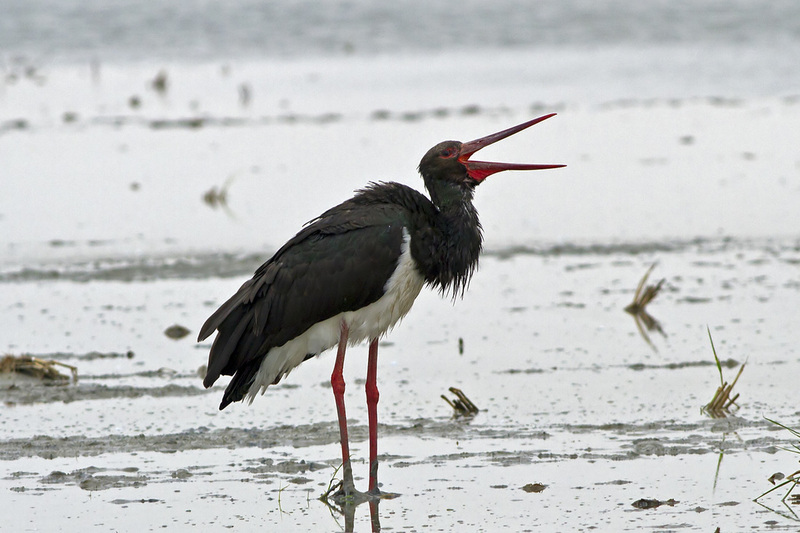 Again this was taken at a waterhole where one has the opportunity to encounter birds at close range. The final entry in this trilogy is again blue themed. 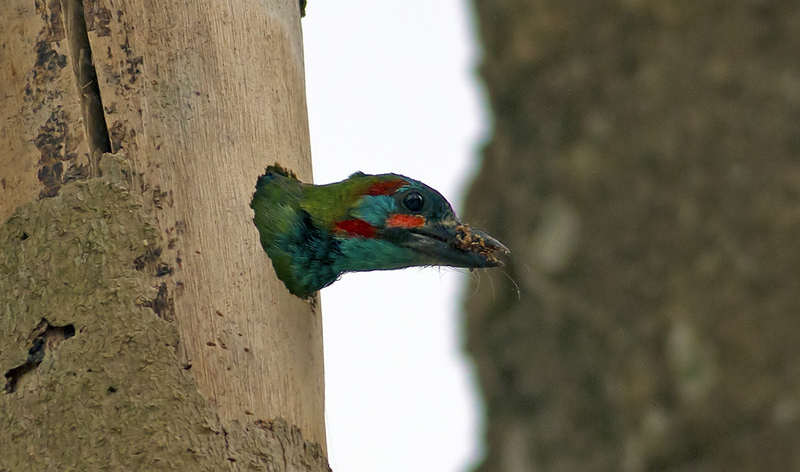 The Blue Eared Barbet is a very photogenic bird, particularly when it pokes its very colourful head out of a hole with a beak full of something, I know not what but it looks like some housekeeping is taking place, a spot of cleaning up going on. The final entry for April is another bird from Thailand. 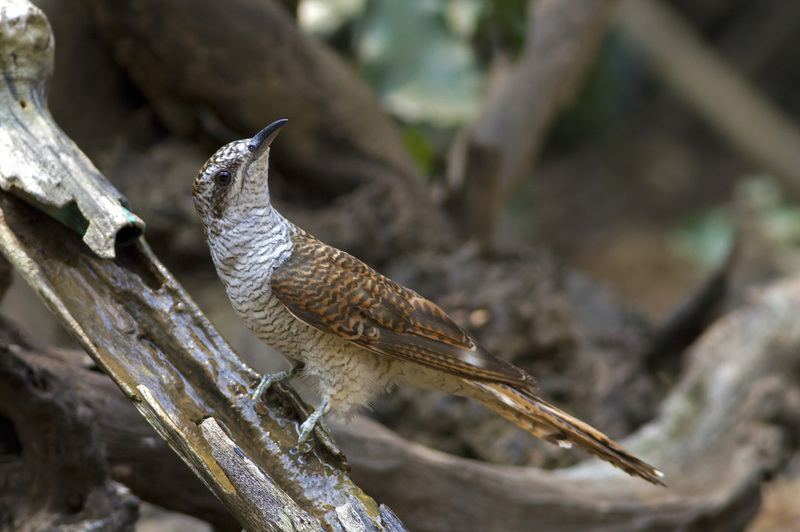 The Banded Bay Cuckoo is spectacular. Not the colour but the striking texture and banding of the brown and white plumage and its sleek, powerful shape, reminiscent perhaps of a wryneck or a falcon. It certainly looked good to me by the waterhole at Ban Song Nok near Kaeng Krachan in Thailand. 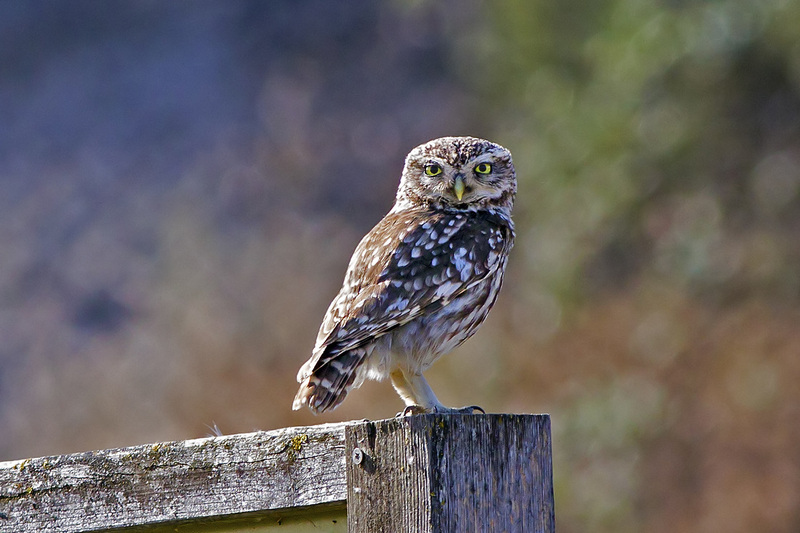 I grabbed a quick shot of this Little Owl that was sitting on a signpost at Fuente de Piedra which is a large inland lagoon near Antequera, famous for its sizeable populations of Flamingos and wintering Cranes. There are of course many other birds to be seen here including the Owl that often puts in an appearance in the grounds around the Visitors Centre. I was surprised at how well this picture turned out as I was not particularly close, but good light and nice background colours make for an effective image of a very bright eyed and imposing bird. 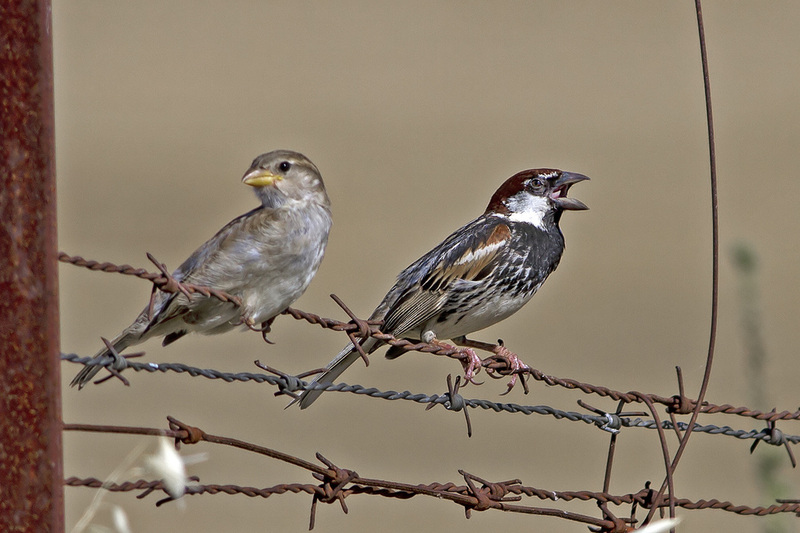 A much underrated bird, the male ﻿Spanish Sparrow﻿ is a very handsome little chap, much more colourful and striking than his House Sparrow cousins. They are fairly numerous along the C-99 roadside near Trujillo in Extremadura. It is unlikely that one will see them around the house as they are definitely countryside dwellers. All the more surprising then that the first one I ever saw was in a large shopping mall (Plaza Mayor) near Malaga. I could hardly believe my eyes but there was no mistaking that striking plumage. Pity I didn't have a camera to hand as no-one ever believes me without direct evidence. July is not usually a good month for birding in Andalucia, it's too hot and dry for most species. However there are oases in this arid landscape that can still support a good variety of bird life, and the Charca de Suarez near Motril is a good example. It is a well managed Reserve with a constant supply of freshwater from the Rio Guadalfeo which reaches the coast here from the Sierra Nevada mountains. 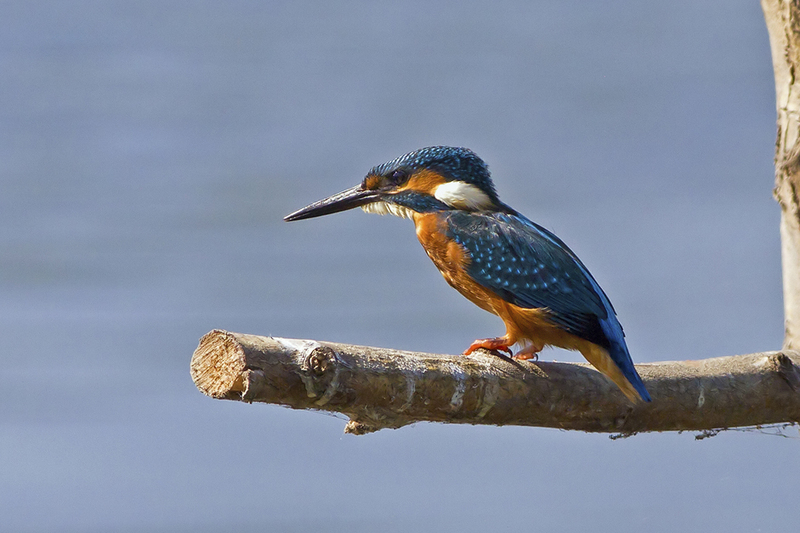 This month has seen an influx of Kingfishers and I was lucky enough to capture one on a branch conveniently placed in front of the main hide for just such a purpose. Ok the next one does not have wings, but this young Ocellated Lizard is such a colourful subject that I thought it worthy of a gallery spot. 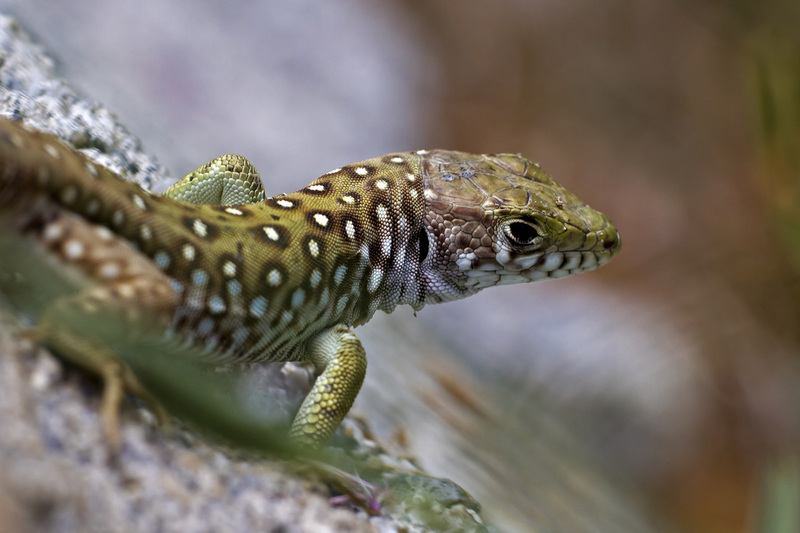 Those dark bordered pure white spots on an olive green back are very distinctive, in fact another name for this reptile is "Eyed Lizard" for obvious reasons. I encountered this handsone chap at the Botanical Garden near the sji resort in the Sierra Nevada, altitude around 2000+ metres. 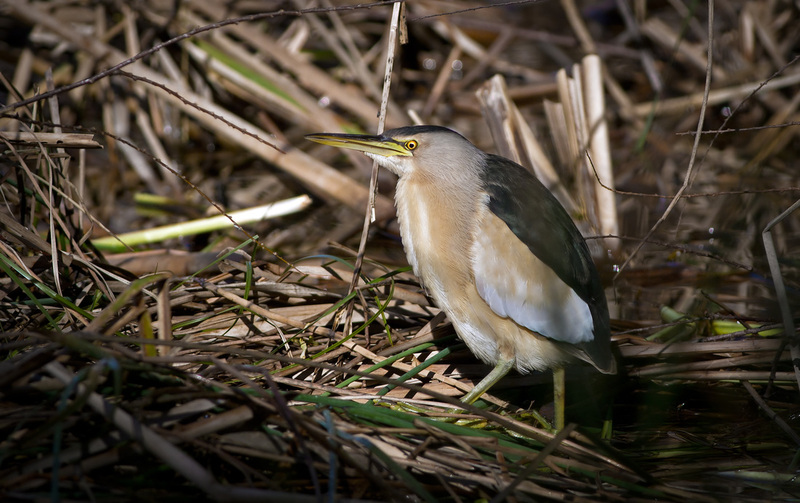 There's that Little Bittern again. They have been resident at the Charca de Suarez all year round and if you catch them on a good day the photo opportunities can be spectacular. I like this shot as the bird is clinging quite precariously to a couple of reed leaves while extending itself upwards to stretch out its left wing.It is an elegant pose suitable for a gallery entry. 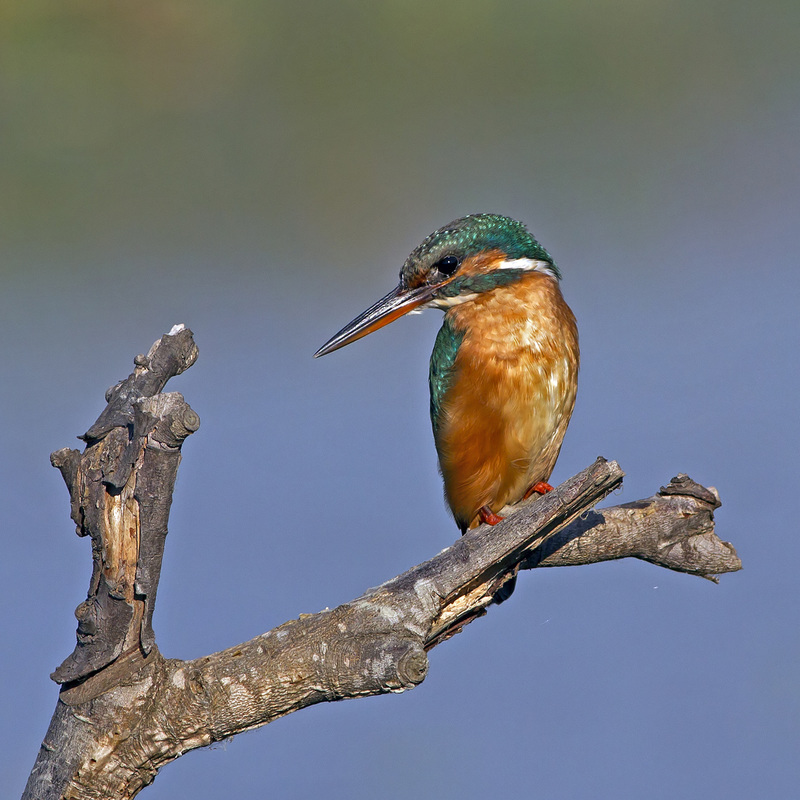 Yes it's a Kingfisher again from the same location as before at the Charca de Suarez. I particularly like this shot though for the detail, composition and bokeh colour so decided to use it as Septembers gallery photo. Several choices this month as we traveled around SW Spain as far as Portugal to observe the migration. A pair of Black Storks surprised us by staying put as we came close to them in their feeding ground, a cut rice paddy on Isla Meyor near Donana. The old male seemed quite unpurturbed and even amused by our approach and I think if I had ventured out onto the thick mud I might even have been allowed to stroke him. It had to be a photo from Ecuador this month, but which one. 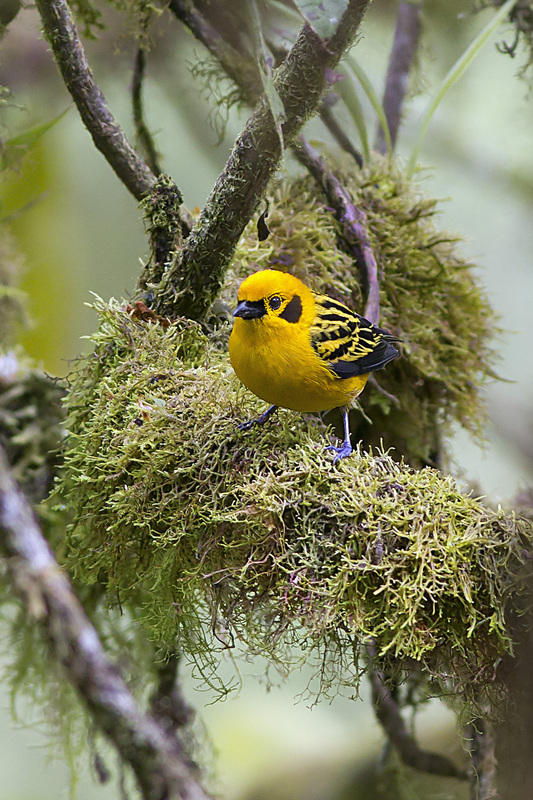 I have chosen this shot of a Golden Tanager. I was very pleased to get the exposure right in difficult light and I like the mossy branch which is an appropriate setting in a cloud forest. My Ecuador trip extended into December at which time I was in the Amazon Rain Forest at Sani Lodge. 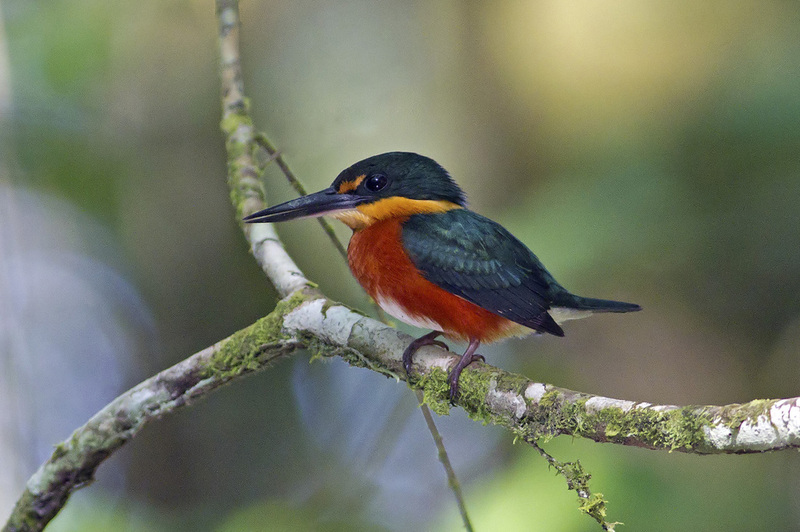 I really like the pastel colours in this shot of an American Pygmy Kingfisher. The photo was taken from a canoe on a beautiful backwater in the forest where I saw so many amazing birds.